So it is, I’ve left Sri Lanka but I’m not really back in Latvia. 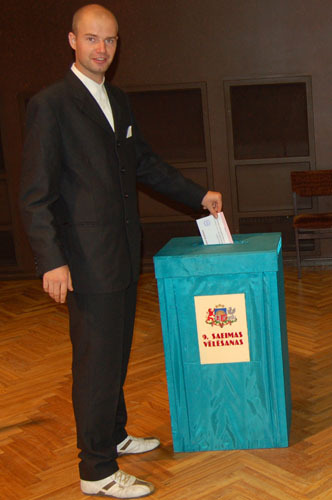 I did my civic duty and took part in Latvian Parliament (Saeima) elections on October 7th. Now I’m in Vienna where I will represent GLEN Latvia in Development Education Partnership Fair till October 12th. On 19th I will head to Georgia for some 2 weeks to see what’s going on there. My 1st impressions about my fatherland (tēvzeme) after 7 months in South Asia are still not real impressions. Everything seems to me familiar and unrealistic at the same time. I will have to readapt or get used to many particular things and habits like using hygienic tissues (tualetes papīrs), drinking water from the tap, etc. I will definitely cook more for myself when I will settle in Latvia more permanently because I don’t feel like very used to fatty (very very!) Latvian food. But I loved (at least for those few days!) very clean fatherland environment. After not seeing sun in Delhi because of heavy smog (smogs) deep breath of fresh air was real pleasure! And check KLUBS magazine October issue (oktobra numuru) where you can find my 3 spread (3 atvērumi) long article about my experiences in Sri Lanka in 2005. Next Sunday on October 15th on LTV's “De Facto” there will be perhaps TV coverage about Latvian Tsunami Relief Mission in Sri Lanka. Check it out!